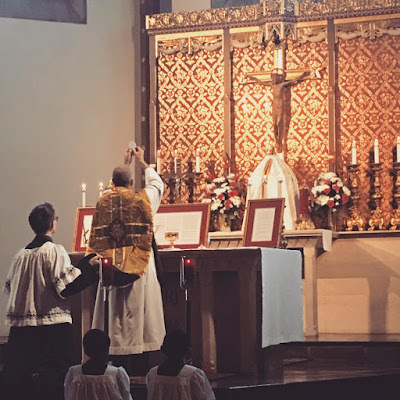 Our thanks to Mr Ryan Ellis for sending in this report of a newly established regular celebration of the Traditional Latin Mass. St Rita’s Parish in Alexandria, Virginia, in the Diocese of Arlington, has long been known as the most liturgically traditional parish in the area. It features the Traditional Latin Mass on two weeknights Tuesday and Thursday, occasionally on Holy Days, solemn vespers on Friday night, and a regular 11 AM Sunday Novus Ordo high Mass. Ad orientem, male altar service, and kneeling to receive communion are the norm, not the exception. But one thing the parish has lacked has been a Sunday “prime time” TLM. That changed on the Fifth Sunday after Epiphany. On the first Sunday of the month, St Rita’s celebrates a Missa Cantata at 9:40 a.m. If the Mass proves popular, it will become an every-Sunday item. This is the only “prime time” Sunday TLM inside the Beltway in Northern Virginia. As such, it’s a big local milestone for the nation’s capital. Sunday’s Mass was well-attended, with over 150 people in the pews. This was a first one, so a drop-off should be expected, but this is a good start. Fr. Gee, the pastor, was the celebrant; there were five altar boys, including a younger MC. The schola alternated between a men’s and women’s section. Given the tight time constraints (there are Masses scheduled at 8:30 a.m. and 11:00 a.m.), the Missa Cantata did not use incense, did not have an Asperges, and did not repeat the readings in English before the homily. The latter feature, especially, was not missed (at least by me). Father chose to stay at the altar and wait for the choir to finish the Gloria (as opposed to retiring to a sedilia; this was likely done for time reasons, but I thought it was a good choice as it eliminated much of the usual discontinuity between choir and sanctuary that one finds at Missa Cantatas. The vicar helped out with communion, and the assembly wasn’t shy about using the altar rail, something I might have expected at a first Mass. The congregation participated in most of the ordinary parts pertaining to them, and in the server responses. This is also typical at the weeknight TLMs at St. Rita’s. All in all, a wonderful first start; I’ll be attending the first Sunday of every month with my family, and hopefully, in time, weekly.